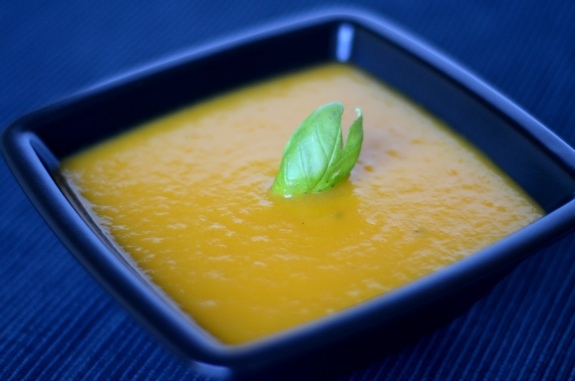 Yes, Campbell’s Gardennay Butternut Squash soup looks this delicious in real life. I don’t like butternut squash. Not one bit. The texture throws me off, and the taste has never done anything for me. More to the point, I’ve never been fond of squash in general. (There. I said it.) So I was floored when I tried, and adored, my first bowl of butternut squash soup at my brother’s wedding several years back. Within days of the vows being exchanged, I had set about searching for a good pre-made, non-fancy-catering soup equivalent. It didn’t take me long to find Campbell’s Gardennay Butternut Squash soup, which has become a cold-weather favourite in my drafty Edmonton apartment. Open the carton, pour it into a microwave-safe bowl, zap it for three minutes (stirring once at the two-minute mark) and presto, you’ve got one hell of a good soup for lunch. I’ve tried some of the other Gardennay flavours, and this is by far the best. The texture is thick and granular, filled with tiny soft chunks of veggie. It sticks to your insides as you eat it, warming you up from your mouth down to your tummy. It also leaves you feeling a lot more full than a thinner soup would. The taste of the squash is obvious, but the blend of other vegetable flavours is what makes me love this soup. Carrots share centre stage with the squash, while potato and onion add that little something extra. The salt content is apparent. One carton of the soup makes for a good meal, though splitting it in two may work if you pair it with a salad and sandwich. 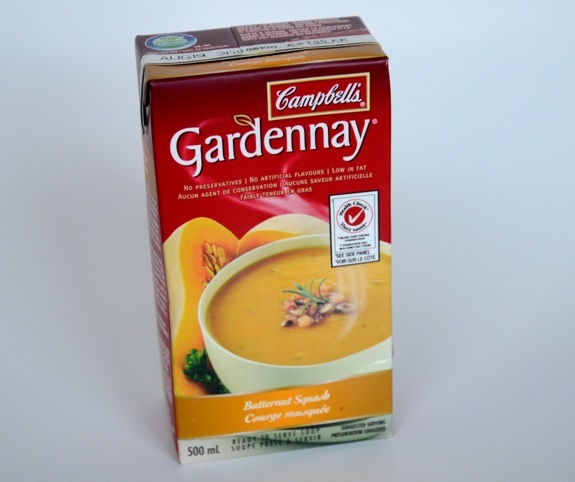 Campbell’s Gardennay Butternut Squash soup — available in a carton, not a can. Cost: About $2 on sale. Usually around $3 per 500 ml carton. Value for cash money: More expensive than a lot of canned soup, but the taste is worth the price. Availability: Easy to find. Most grocery stores have it. Nutrition? : 120 calories per 250 ml, which works out to 240 calories per 500 ml carton. (Who said journalists can’t do math?) Very reasonable. Lots of Vitamin A, a fair bit of fibre, and, unfortunately, enough salt per carton to get you halfway to the daily recommended amount. Vegetarian friendly? : You betcha. But cream, butter and buttermilk powder are all in the mix, so it’s not vegan. The verdict: Wonderful winter food. Stock up when it’s on sale, then work your way through the pile until spring arrives.